MMJ Electrical has established a reputation as the leading electrician in Coconut Creek, Florida. We are a family owned and operated business that is led by a master electrician with over 25 years of experience. When you choose our company, you will receive an uncommon level of service from start to finish. Of course, you do not have to take our word for it. Simply take a look at the reviews that are posted on this website to check out some remarks from our satisfied clients. Coconut Creek is a physically beautiful place that has earned the nickname “The Butterfly Capital of the World.” It is a fine place to live, work, and play, and we have spent a lot of time in the city. We provide fast responses all over town, from West Dixie Bend to City Center to Hillsboro Ranches and everywhere in between. To sum it up in a phrase, for electrical repairs in Coconut, Creek, FL, MMJ Electric is the trusted resource. We definitely have you covered whenever you need an electrical contractor as an individual homeowner, but our offerings do not stop there. 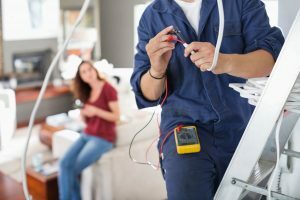 If you are a business decision maker in Coconut Creek, an electrician will definitely be needed from time to time. It is important to develop a relationship with an electrical contractor that has wide ranging expertise on the commercial level. Our electricians have a great deal experience providing all types of electrical repairs for members of the local business community. You can rely on us for indoor and outdoor lighting repairs, low voltage installations, lighting protection systems, phone and data cabling, and much more. Plus, if you are responsible for a business, security means everything. We can be called upon to install a closed-circuit camera system so that you have a watchful eye in the sky at all times. Fire alarm systems are also available through our company, and we provide monitoring around-the-clock at our UL Certified Central Monitoring Station. The electrical repairs and installations that we do for residential and commercial clients are at the core of our business, and we place an equal emphasis on top notch customer service. Whenever you need an electrician in Coconut Creek, Florida, give us a call at 954-876-1536. We also have a contact form on this website that you can use to send us a message.